Intel has hailed Skylake as its most important chip architecture in a decade and now says that it will be used in mainstream Core i3, i5 and i7 PC processors as well as Xeon server chips. The first Skylake chip is expected to be Core M, designed to be used in Windows as well as Android tablets and hybrids. 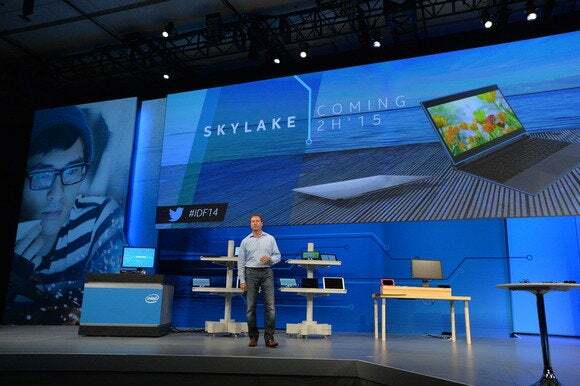 The first Skylake PCs are expected to be available in the second half this year. Dell, for example, has said it will launch Skylake laptops in that time frame. Intel’s chips are used by most PC makers. Intel is expecting big graphics performance improvements, longer laptop battery life, and better CPU performance with the new chips. Skylake will also allow users to wirelessly charge laptops, connect to monitors, and transfer data to peripherals. “When I look at the range of what Skylake’s able to deliver from the Core M level all up to the i7 and Xeon, it’s just going to be a fantastic product,” said Intel CEO Brian Krzanich, in an interview with the IDG News Service at Mobile World Congress in Barcelona. Up to now, Intel had confirmed only that Skylake would be going into Core M chips. Intel is hurrying to get Skylake released and close the curtains on the troubled Broadwell architecture, which was delayed due to manufacturing issues and reached mainstream PCs just two months ago. Intel usually updates its chips on a yearly basis but Broadwell is expected to have a shorter-than-expected life since Skylake is just around the corner. Many PC makers like Dell and HP have skipped Broadwell chips in some laptops and are waiting for Skylake. Intel wants to move quickly on Skylake because of demand from the company’s customers, which are mainly device and PC makers. “We didn’t want to delay it, we talked to our customers, they didn’t want to delay it. Everybody’s just saying no, full speed ahead,” Krzanich said. Skylake is an architecture upgrade—which is called a “tock”—and will be made using the 14-nanometer process. PCs with Skylake will be able to run the Windows, Chrome and Android operating systems. Intel could divulge more details about Skylake chips at the Computex trade show in Taipei, which will be held in June.